Cesar Millan has a new mission with his latest TV series, which debuted this month: to rescue, rehabilitate and rehome dogs. "There's an episode with a family where the dad didn't have anymore to give in his mind," the dog behaviorist told CBSNews.com. "So we found a dog that was really in the same position. She didn't want to relate to anybody. But when this dog met this family, something really beautiful happened. So now the dog had a purpose -- 'OK, I'm going to help this person...we can help each other.' It's just a beautiful story." It's just one of the stories that will be told as part of "Leader of the Pack," an international competition where Millan aims to give dogs a second chance at life. In each episode, Millan coaches families vying for a chance to be matched with the pups. By going overseas to the U.K., Italy and The Netherlands to film the show, Millan hopes to bring attention to the homeless dog issue. There are an estimated 600 million stray dogs around the world, and Millan hopes his series can help curb the issue. "It's getting worse because we're becoming a disposable society," Millan said. "Christmas just passed and a lot of puppies were given as a gift, but not everyone does the proper preparation by asking yourself, 'Is my kid responsible, or am I just nurturing an impulse?'" "It [homeless dogs] becomes to me a global problem," said Millan, who grew up working with animals on his grandfather's farm in Mexico. "I'm in a position where I can do a show -- where I can bring awareness to people." So, how does Millan decide which family will get to take the dog home? "The dog is definitely the one [to decide]. The dog is saying, 'I am respectful to this family, or I am not to this family.' It's definitely a combination of the sincerity of the dog and the knowledge that helps you understand why this dog should be with you," said Millan, who has 20 dogs of his own. The competition element is something Millan didn't tackle with his previous series, "The Dog Whisperer," which ran from 2004-2012. But he really likes the idea. "People put more effort when they are competing," he said. "When things are simple, nobody wants to do much about it. It brings out the competitive side of people. Everyone participates. I thought, 'Let's create a competition where you can have fun and help somebody.'" And as always, Millan hopes his on-screen tips will help viewers watching at home. "When families do decide to get a new pup, the biggest thing is to have an agreement as a family," said Millan. A lot of it comes down to energy, he says, specifically deciding which energy level is the best fit: low, regular, high or very high energy. Millan also said a long walk "is the best gift you can give" a new dog. "So when you come home, your home represents a place of resting," said Millan. And back at his own home, Millan has a new pup to add to his growing pack. His girlfriend, Jahira, and his son, Calvin, recently rescued a female dog after witnessing her get hit by a car. They named the dog Marilyn, after Marilyn Monroe. Still passionate about his craft, Millan feels right at home with his gig as a dog behaviorist and has even passed along his passion to Calvin, who recently said he wants to follow in his father's footsteps. "It was a dream," said Millan, who says he came from a poor background and arrived in the U.S. at age 21 knowing no English. "I was 13 years old when I said, 'I want to be the best dog trainer in the world.' You can dream for things but then destiny or God has surprises for you. I didn't know I was going to have a TV show or write books. No idea about that. The beautiful thing about being poor is that you have nothing to lose when you dream big. When you dream, you dream like you really want it." 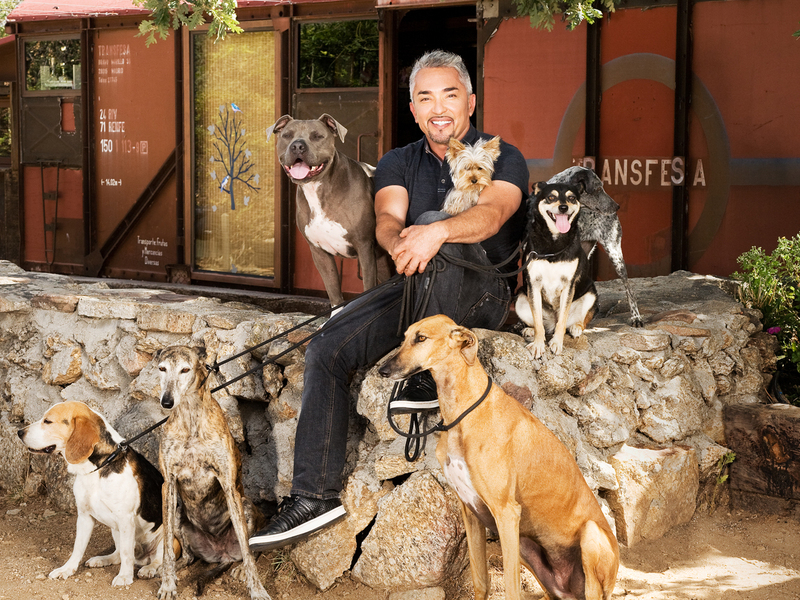 "Cesar Millan's Leader of the Pack" airs Saturdays at 10 p.m. ET on Nat Geo WILD.